Until recently my only personal association with cast iron was a skillet that I owned long ago and that served me well, as long as I dried it carefully so as to prevent rust. As for terra cotta (“baked earth” in Italian), for me it meant ceramic figurines of one ancient culture or another, and panels of sculpted figures by Luca della Robbia that I had once seen in distant Florence. Though vaguely aware of cast-iron buildings in Soho, I had never really looked at them closely, and had no idea that terra cotta had anything to do with New York City architecture. Until, that is, I heard of two nonprofits active in the city: Friends of Cast-Iron Architecture and Friends of Terra Cotta. At which point I decided that, if they each had friends organized in a nonprofit, cast iron and terra cotta bore looking into. A glance or two online convinced me that both were significant in the history of New York City architecture and deserved to be seen in the field, meaning, in buildings in this city. · At Seventh Avenue and West 11th Street, construction of a luxury tower on the site of St. Vincent’s Hospital, now demolished. Why the hospital, founded in 1849 and once one of the best in the city, went bankrupt in 2010 remains a mystery, and one well worth probing. As a Villager who was once treated there, and who mourns the loss of the only full-service hospital in the area, I resent the construction of still more luxury housing and can only view this coming monstrosity as an insult to the psyche. A sour note right at the start of the walk. A Greek Revival house on West 11th Street. · Along West 11th Street between Seventh and Sixth Avenues, a number of well-preserved Greek Revival houses and brownstones – for me, always a source of delight, and welcome relief after the painful reminder of St. Vincent’s. · Just beyond Sixth Avenue, a triangular sliver of a Jewish cemetery established in 1805. The Jews of that time were Sephardic Jews whose ancestors had fled persecution in Christian Spain and Portugal and finally found refuge in New York. When the cemetery, the third Jewish cemetery in the city (though labeled the second), was first established, there were cow pastures nearby, and children would jump the fence to steal apples from apple trees growing among the graves. But in 1830 the city planned an extension of 11th Street right through the cemetery westward to Sixth Avenue. Faced with the loss of their cemetery, the Jews petitioned the city to preserve a small slice of it not needed for the street extension, and their request was granted. Blocked off now by a wall and overshadowed by the neighboring buildings, the cemetery is easy to miss, but when walking that way I never fail to glance at it through a grilled gate; some twenty worn headstones survive. · At 18 West 11th Street, a new row house whose jutting angular façade clashes with the older buildings on the block: a reminder that this modernist upstart is built on the site of an old Greek Revival townhouse built in 1845 and totally demolished on March 6, 1970, by an explosion. While the owners of the building, a radio-station executive and his wife, were vacationing in the Caribbean, their little girl and her Weather Underground friends were making bombs in the basement. Unfortunately – or maybe fortunately, given their intentions -- none of them had experience in handling explosives, with the obvious result. The blast killed three of them and reduced the building to rubble, but two others, stunned and bleeding, survived and escaped. That the Landmarks Preservation Commission approved the jutting oddity now blemishing the site is, to put it mildly, shocking. It’s their job to prevent such anomalies. The Conservative Synagogue of Fifth Avenue. · Just across Fifth Avenue, the Conservative Synagogue of Fifth Avenue, a small two-story structure at 11 East 11th Street, its white façade with black trim set well back from the street and enjoying that rarity in Manhattan, a plot in front with benches and a bit of greenery. Hardly noticed by most passersby, the quaint little building has undergone many a change. Built in the 1830s as the carriage house for a Fifth Avenue residence, it was set well back from the street by the builder, a wealthy attorney, so his genteel neighbors wouldn’t be assailed by the smell of manure. In 1867 a police raid on the little building revealed, smack in the midst of one of the city’s most fashionable neighborhoods, a disorderly house with five women in residence. Converted to a garage and then to a one-family residence in the early twentieth century, the building survived, squeezed in between a hotel and an apartment building. In 1930, a year after the Great Crash, the occupant, a Wall Street broker, was so disheartened by stock-market losses that he committed suicide. Preserved over the years because of its unique charm, in 1960 no. 11 East 11th Street became a synagogue. · On a stoop of one of the old buildings in the block, a Nepalese mother with her young son, both fluent in English, selling lemonade as a benefit for the victims of the recent earthquakes in Nepal. John and I talked with her briefly, and we each bought a lemonade for a dollar. · Beyond University Place, at the corner of East 11th and Broadway, my first goal, the cast-iron building at 67 East 11th, an impressive structure indeed. More of that anon. 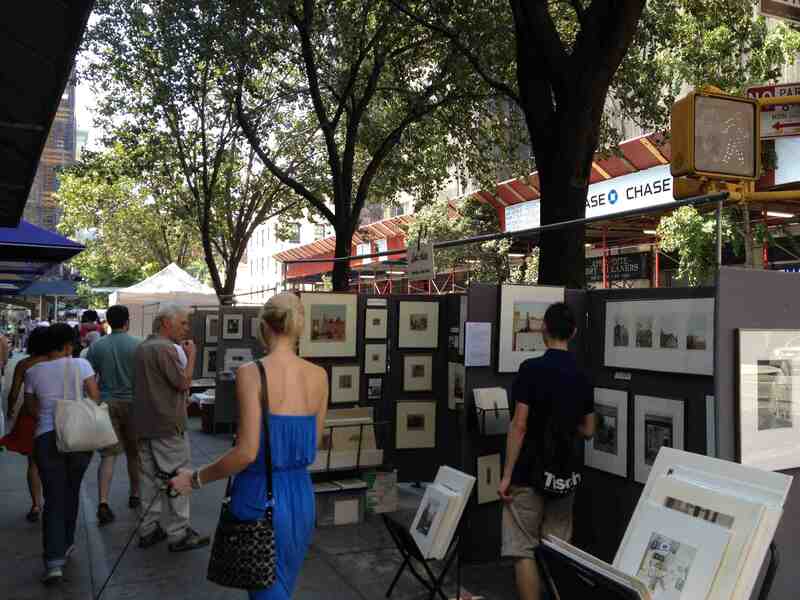 · Along University Place from 11th Street down, bustling crowds visiting the Art Exhibit and, at a stand near West 9th Street, the second goal of the walk, our friend Henry’s work on display, with a whole bunch of paintings in a new style for him, fantasy landscapes reflecting scenes of his imagination rather than re-creations of real scenes he had observed. I admired all the new works, and especially the one that had been awarded the Exhibit’s top prize for landscapes. · At Sixth and Greenwich Avenues, as I came back alone along West 9th Street from the exhibit, the Jefferson Market Garden, open to the public and celebrating its fortieth anniversary, having been created in 1975 on the site of the demolished Women’s House of Detention, a West Village Bastille of ill repute. I took a brief stroll through the grounds, reveling in the flowers and foliage and regretting not one bit the prison that once loomed gloomily on the site, its inmates shrieking obscenities and calling down to friends on the street. There are times when gentrification, that bane of preservationists, pays off. So ended my stroll through the Village. Now about 67 East 11th Street. Built in 1868, the huge seven-story structure (though I count only six) takes up much of the northern or uptown side of the block between University Place and Broadway. Four tiers of Corinthian columns, their capitals adorned with intricately molded foliage, stretch across the beige-tinted façade all the way to Broadway, framing the tall windows, each window topped by a rounded arch. The ground floor is occupied by shops: KidVille, the Bergino Baseball Clubhouse with baseball memorabilia, and Le Pain Quotidien (the Daily Pain, as I like to call it). Crowning the building above the tiers of columns, alas, is a top floor that looks like a drab substitute for the original mansard roof. Massive, the building lacks the charm of Greek Revival and brownstone houses standing in tight-packed rows like a baker’s loaves on a shelf, but it has a solitary epic grandeur, a magnificence that struck me at once and steadily grew as I continued to view it. The structure served originally to house McCreery’s dry-goods store on Ladies’ Mile, a stretch of Broadway occupied in the Gilded Age by fashionable department stores catering to the wives of the affluent. Just across the avenue was (and still is) Grace Episcopal Church, a splendid Gothic edifice that served those same wives and their husbands, the source of all their wealth. In 1903 McCreery’s moved out, following the uptown migration of its clientele, and the building became a factory making ladies’ shoes and handbags. Having survived a fire in 1971, no. 67 was converted to a co-op with 144 apartments in 1973, the first such conversion of a loft building in the city. Known today as the Cast Iron Building, the structure has landmark status and is advertised as offering a renovated lobby; a doorman, concierge, and security guard; high ceilings, fabulous views, and an elevator; and for some units a sun-drenched terrace. Tempted to move in? Fine, but a one-bedroom apartment will cost you close to $1 million or more. John and I were mightily impressed by the Cast Iron Building, but one thing puzzled us: where was the cast iron? All we saw were stone columns and surfaces, and rounded arches over outsized windows. The cast iron, we decided, must be masked by all these decorative features. Which shows how little we knew. Back in my apartment I did a bit of online research, and all was made clear. Cast iron, I learned, was often painted so as to simulate stone, so the entire front of no. 67 – the whole massive beige-tinted façade we had been looking at – was made of the material, and the building merited its name. To verify, you could use a magnet, but not having one, on my second trip a week later I did the next best thing: I touched the façade and found it smooth, and then, on my way back, I touched brownstone and other genuine stone façades and found them either faintly or decidedly rough. Armed with this precious information, I set out to learn more about the cast-iron buildings of Manhattan. But first of all, what’s the difference between cast iron and wrought iron? Once again, Internet research enlightened me. Cast iron is iron that has been heated to a liquid state and then poured into a mold to give it a desired shape. Wrought iron is iron that has been heated and then worked with tools – hammered, bent, twisted -- to produce its shape and form. Cast iron can be mass-produced; in the nineteenth century wrought iron was a handcraft where each product was produced individually. The stoops of many a brownstone have wrought-iron railings. The use of cast iron for entire façades of buildings dates from the mid-nineteenth century and was especially popular in New York, which today has the largest concentration of such buildings – some 250 of them -- primarily in Soho. The appeal of cast iron was that it was cheaper than brick or stone, and also lighter; also, it had strength and durability, and was thought to be fireproof as well. Cast-iron façades were machine-made and mass-produced, and could be bolted onto the fronts of buildings by unskilled laborers. Also, they could be cast in decorative designs that mimicked masonry, and could accommodate larger windows than those in masonry buildings. Once imported from England, by the 1850s cast-iron products were being made in small foundries right here in Manhattan and Brooklyn, usually near water so supplies could be shipped in and products shipped out by boat. And since these prefabricated products could be assembled on a building site anywhere, they weren’t just used locally, primarily in commercial buildings, but were also exported throughout the country. In New York City the Italianate style dominated in the 1850s, imitating masonry and featuring long rows of round-arched windows that admitted a flood of sunlight into the once somber gas-lit interiors of commercial buildings. Then, by the late 1860s, cast-iron buildings began to show the influence of the French Second Empire style. No. 67 East 11th Street is a mix, being Italianate but originally with a mansard roof; it was typical of its time in being painted beige to imitate stone, the material associated with architectural masterpieces. Cast iron was also used imaginatively in grandiose structures like Commodore Vanderbilt’s Grand Central Depot. Completed in 1871, its vast enclosed space – the largest on the North American continent – was topped by soaring, filigreed iron arches and glass roofs, making it a tourist attraction rivaling the Capitol in Washington, D.C.
What brought an end to the era of cast-iron construction? In the 1870s, fires in Chicago, Boston, and New York showed that cast iron was not fireproof after all; subjected to the intense heat of a large conflagration, it buckled, and when exposed to the cold water of fire hoses, it cracked. In 1885 restrictive revisions were made to the New York building code, rendering cast iron a less attractive option for builders, and after that its use declined. But what really did cast iron in as a construction material was the advent of steel in the mid-1880s. By the mid-twentieth century cast-iron buildings were underappreciated and in danger of neglect and demolition. Then Margot Gayle, an early advocate of preservation, formed the Friends of Cast Iron Architecture in 1970 and worked hard to document the surviving cast-iron buildings and work for their protection. Brandishing a small magnet to test if simulated stone façades were cast iron, she was charming and persistent, a feisty and determined nuisance. Said another landmarks advocate, “Heaven help the person she gets her teeth into.” Thanks largely to her badgering everyone in and out of government, the SoHo-Cast Iron Historic District was created in 1973, saving that unique concentration of cast-iron structures from the depredations of Robert Moses’s grandiose projects. Since then, more buildings have been protected as individual landmarks or part of other historic districts in Manhattan. When Soho developed into a trendy shopping district, Margot Gayle was less than thrilled, but conceded that it was probably necessary. “That’s the price of getting something saved,” she observed. “There’s got to be money in it for someone.” A tireless crusader with both feet on the ground. One surviving relic of the cast-iron age is the cast-iron electric lamppost, which dates back to the early 1890s. At last report there are 62 of them that have individual landmark status, in addition to others included in landmarked properties or districts. They are characterized by ornamental design, usually some kind of curlicues topping a simple base and shaft. But you have to look for them, and they are scattered throughout the city. The earlier gaslight lampposts are even rarer, but I have seen one at Patchin Place, a gated alleyway on West 10th Street, across from the Jefferson Market Library. A lamppost in the style of the 1860s, it has no curlicues, but a crossbar beneath the lamp that was used for propping up a lamplighter’s ladder. One of the last gaslight lampposts in the city, since the 1920s it has been powered by electricity. And now at last we’ll look at terra cotta, which became a popular architectural material in the U.S. in the late nineteenth century. It was sturdy, relatively cheap, and fireproof, and could easily be molded into ornamental detail. Also, it could be made to look like granite or limestone, which were more expensive. Though first introduced in the 1850s, opposition of the stonecutters and masons, who felt threatened by it, delayed its widespread use for decades. The first successful local terra-cotta manufacturer began operations in 1886, and its use then increased. Lightweight terra-cotta ornamentation often adorned the early New York skyscrapers, including the Flatiron Building (1901-03) and the Woolworth Building (1913). Completed in 1899 by Chicago architect Louis Sullivan, the Bayard-Condict Building at 65 Bleecker Street, between Broadway and Lafayette in Noho, is a prime example of glazed terra-cotta ornamentation. Thirteen stories high, its white terra-cotta façade has ornate floral motifs – clusters of intricate little leaves and curlicues – at the top and bottom, and a highly decorated crown with fifteen-foot-high spread-winged angels under the cornice. A city landmark today, at first glance it is astonishing. The exquisitely rendered detail at the top, barely visible from the ground, reminds one of sculptural detail crowning the great Gothic cathedrals of Europe, fully visible only to God and his angels. Detail from the top of the Bayard-Condict Building. A better view than you'd ever get from the street. The Bayard-Condict Building is unusual in being completely clad in terra cotta, which more often served to adorn the higher reaches of buildings, giving today’s terra-cotta enthusiasts a pain in the neck matching that of warbler watchers in Central Park. Exactly one week after my cast-iron exploration on East 11th Street, I did the same walk by myself so as to see a building with terra-cotta ornamentation just across Broadway from the Cast Iron Building. As I approached Broadway on 11th Street, there it was straight ahead at 808 Broadway, just north of the Grace Church property. High up on the seven-story brick and stone façade, and best seen from a distance, were Gothic arched windows, scroll panels, and other ornamentation in terra cotta – exquisite detail that I had managed to miss on countless treks down Broadway over the years. Now a luxury co-op (what isn’t, these days in the city? ), 808 Broadway has surrendered its ground floor to New York Costumes, whose signs in bold lettering announce “Halloween Adventure,” “Visit Our Magic Department,” “No food or drink,” “All sales final,” and “Open.” Here, every day is Halloween, with windows displaying strange creatures in fantastic outfits, as for instance a ghoulish character in a blue Napoleonic uniform with gold epaulets, and a hideously grinning skeleton in a fluffy white bridal outfit with glinting jewelry. What passerby, seeing such a clutch of spooks, would think to look high up to savor the subtler, more delicate effects of terra cotta? But before I draw a distinction between the Halloween-obsessed hoi polloi and the cognoscenti enamored of terra cotta, I remind myself that for decades I was one of the hoi polloi, though at least I was aware of the Gothic jewel that is Grace Church. · Brightly colored ornamentation on the Grosvenor, one of the first Fifth Avenue skyscrapers, at 39 Fifth Avenue, built in 1922. · Similar decoration on 32 Washington Square West, as well as rondels (circular panels) featuring the heads of George and Martha Washington, 1925. · Banding and detailing on the Judson Memorial Church at 54-57 Washington Square South, which dates from 1888-93; the church itself is Lombardo-Romanesque in style and made with long, thin red bricks. · Elaborate polychrome ornamentation, showing a rising sun flanked by winged griffins, high up on the Fred F. French Building, a 38-story Art Deco skyscraper at Fifth Avenue and 45th Street, 1927. · Green glaze set against the chocolate brickwork of the Church House of the First Presbyterian Church at 12 West 12th Street, a modern example of terra-cotta ornament dating from 1960. Judson Memorial Church on Washington Square South. at the very top. But the "pepsi" probably isn't terra cotta. Like architectural cast iron, terra cotta had its moment of glory in New York and then faded from the scene. Fatal to it was the new International Style of architecture introduced to this country in an exhibition at the Museum of Modern Art in 1932. American architects were so taken with the new style, with its emphasis on simplified geometry and a lack of ornamentation, that they abandoned the exuberant ornamentation associated with terra cotta. Clean lines and flat surfaces were now the rule; spread-winged angels and foliage and curlicues were out. Throughout the rest of the century glass and steel geometry triumphed in the soaring high-rises that mark the city today. But that was not the end of terra cotta. Just as the decline of cast-iron architecture led in time to renewed interest in it and the founding of the Friends of Cast Iron Architecture, so the decline in terra-cotta ornamentation and subsequent neglect of it led a group of preservationists in California in 1981 to found the Friends of Terra Cotta, a nonprofit dedicated to the promotion and preservation of terra cotta as an architectural material. Today Susan Tunick, a ceramics artist living and working in New York, is a national spokesperson for the preservation of architectural terra cotta, and the author of Terra Cotta Skyline: New York’s Architectural Ornament (1997). She is also the president of the New York City branch of the Friends of Terra Cotta and gives walking tours revealing the terra-cotta treasures of the city. As a subject, New York City is inexhaustible. Just as I have discovered architectural cast iron and terra cotta, having in my ignorance walked by examples of each not for years but for decades, I hope to discover more aspects of the city, architectural or otherwise, on future walks both virtual and real. I invite everyone to do the same. If you live in the city or visit it, don’t go too fast. Slow down, open your eyes, and look; there are marvels all around you just waiting to be discovered. Coming soon: Addictions: those things we cling to obsessively, simply cannot do without, with a glance at a man who loved excitement, a man who loved his boats and the river until they killed him, a man who loved rushing to fires, and an angel in a top hat. And then: catastrophes.